Over 100 years ago, Dr. Maria Montessori, an Italian physician, created a new vision of education for children, often thought of as the "education for life". Her philosophy is based on the natural development of children and their intrinsic desire to explore, discover, and learn from the world around them. The Montessori method of education is a model that serves the needs of children of all levels of mental and physical ability as they live and learn in a natural, mixed-age group - very much like the society they will live in as adults. The Montessori method strives to arouse a child's interest; to stimulate, and to provide an individualized learning atmosphere. We are firmly committed to Maria Montessori's approach to learning in our overall program. Our emphasis is not just on short term results for your child, but long term success. 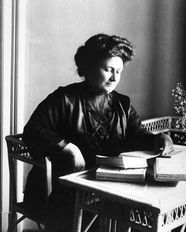 If you would like to learn more about Maria Montessori and the Montessori method, we encourage you to check out the resources listed below.